Brand New 96"96"x78" (Approx. 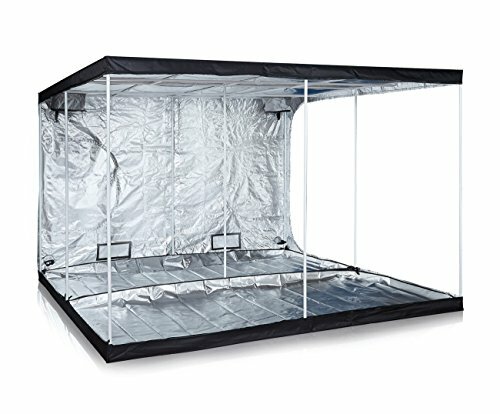 8x8x6.5Ft) Upgraded Large Door Grow Tent with Improved Reflective Interior Mylar. All metal construction, 600D oxford cloth with exterior zippers design ensure safety and convenient use and easy to set up. Brand New 96"96"x78" (Approx. 8x8x6.5Ft) Upgraded Large Door Grow Tent with Improved Reflective Interior Mylar. With EZ view window design, you do not need go inside the tent to check on the plants. 100% lightproof environment. Designed with exterior zippers so that you can setup and take down in minutes, safety and convenient use; Window design for much easier to access. Suitable for use with 400W, 600W and 1000W grow lights and the larger T5 lights for propagation; Multiple vents to accommodate fans and filter.